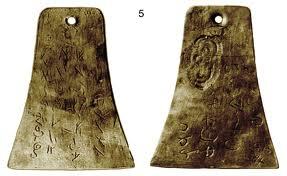 "The Kinderhook plates were a set of six small, bell-shaped pieces of brass with strange engravings which were claimed to have been discovered in 1843 in an Indian mound near Kinderhook, Illinois. According to Wilbur Fugate in 1879, the plates were carefully forged by himself and two other men (Bridge Whitten and Robert Wiley) from Kinderhook who were testing the validity of the claims made by Joseph Smith, founder of the Latter Day Saint movement, at that time headquartered in Nauvoo. According to Latter Day Saint belief, the Book of Mormon was originally translated by Smith from a record engraved on Golden Plates by the ancient inhabitants of the Americas." Entry for Kinderhook Plates in "Fair Mormon Answers"